I love free-motion couching with Free-motion Couching Foot #43… when it is NOT free-motion. 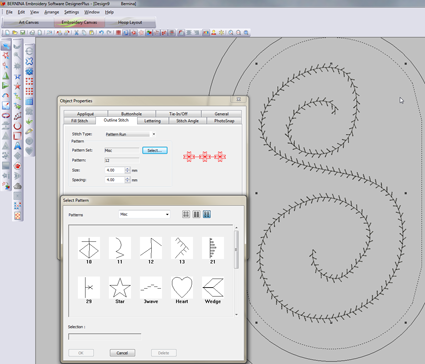 Using BERNINA Embroidery Software 6 it is easy to turn any line into “free-motion” couching. This free-motion couching is perfectly stitched, and never misses the yarn! Each swirl was created with a different thread color, so the stitching stops after each individual swirl. You can continue adding swirls until you have the design you like. This one design produces MANY different swirls! It is easy to create your own designs using BERNINA Embroidery Software 6. Just convert any line to a Pattern Run Stitch. Select the Misc Pattern Set > Stitch 12. Change the Size and Spacing to 4mm. It’s that easy! We are continuously striving to further develop our product. With the launch of BERNINA Embroidery Software 8, new content pertaining the free-motion couching will be made available. A series of videos and tutorials are planned to be released between later this year and early 2017.